Slide the torque eliminator over the gland, tongs toward the gland end. 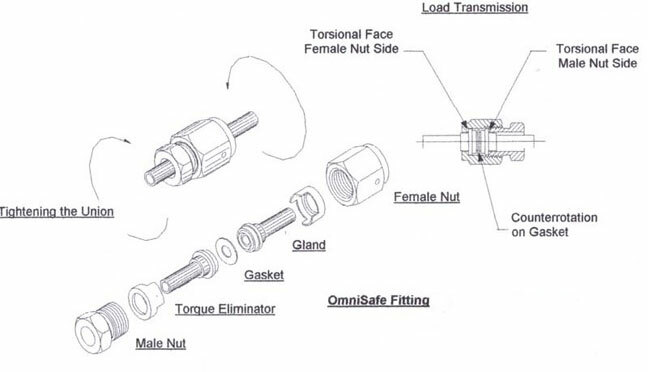 Slide the male or female nut over the gland behind the torque eliminator. Weld the gland to the tube or component tube stub. Insert one new gasket between the gland faces. Hold in place by sliding the torque eliminator and the female nut forward. Hold the male nut stationary. Spin and push the female nut forward, with the torque eliminator inside, to engage the male torque eliminator. Once the torque eliminators are engaged the male and female nut will thread together. Rotate the female nut until the nuts are threaded together finger tight. Using wrenches, hold the male nut stationary while turning the female nut 1/4 of a turn. The tongs of each torque eliminator prevent axial rotation. This engagement completely cancels the wind-up torque transmitted to the glands. 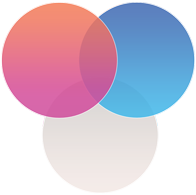 Result: The two glands are compressed linearly into the gasket with no rotation, no galling, and no particle generation. 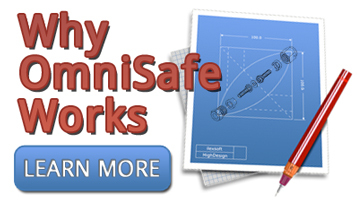 OmniSafe will not loosen due to shock and vibration (Mil Std 810E).